What’s the best time of day to publish a tweet or send an email? A simple way to generate endless ideas for blog posts. How to get good at making money. The opinions about what works best on what day and at what hour — regarding social media — are endless. Two “experts” will give you five answers. One remedy for this comedy of errors is to make use of data, which is exactly what Mr. Phelps (through Mr. Zarrella) presents in this article. Martin Luther’s now famous blog post 95 Theses on the Power and Efficacy of Indulgences used a very crude content management system — a nail, a piece of paper, and a church door. Do not discount this publishing act as a 500-year-old curiosity, the successful spread of Luther’s message has much to teach us about our own social, multimedia world. The term “Content Marketing” has nearly gone household. But that’s meaningless compared to what executing a smart content marketing strategy can do for your business or ideas. Here’s 8 important content marketing articles you should’ve gotten around to last year, but might have missed. If you’ve ever despaired that you’ve missed the bus, that the sands of time have passed too far through your hourglass, or that you’ll lose your mind the next time you read an article about a 20-something CEO who’s built the hottest startup in the valley… take courage. If you are a late bloomer in business or in life, you are in good company. Very good company indeed. Mr. Keath provides a supremely helpful overview of 8 basic email marketing strategies, as well as the pros and cons of each. If you’re thinking about email, you’ll want to read this rundown first. It’s common to run into seemingly unbelievable headlines on the internet. Sensation draws a crowd. This is not one of those headlines. Mr. Alsopp makes a death-defying claim from atop a high wire, and then fully delivers on that promise in this stunningly useful article. Pragmatic advice from a man who has proven he knows how to bring home the bacon. 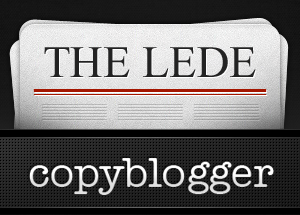 Did you miss anything on Copyblogger recently? The only sure thing about tweeting is do it and do it often! Great list. I really like the description of the last link you listed in this post, Robert – I considered it’s the sentence of viral marketing. Loved the article on how to get good at making money by J Fried. Excellent stuff. The Malcolm Gladwell article has re-nenergized this soon-to-be 55 year old; the “How I generated one years worth of content ideas in one hour…” article and the J Fried article on learning how to make money gave me nuts and bolts to go forward. Thank you for the terrific links, very informative and I’ll share it with my followers. Thanks for this list. I love the link about Martin Luther’s blog post; I haven’t checked it out yet but I will. What caught my interest is how far we’ve come technology-wise from the nail and the Church door. Yet in terms of human nature, I’d say we are still very much the same. Thank you for great links! I enjoyed reading these articles. That Jason Fried is one smart dude. His Making Money piece is a big help to me now that I’m starting to think about monetization. His advice on bootstrapping makes me feel good that I’m not trying to fund my blog (much) to get it going…well, my Genesis theme excepted :-). Very informative articles, especially the last one about making money. Thanks! There’s not much I love more than an interesting and informative link round-up. Thanks so much for stashing a variety of information in one place! Loved that article from Malcolm Gladwell. Great perspective on the development of creative potential. There’s hope for us old dogs! Love the information regarding selling, people don’t care just about facts and features of a product. That really does resonate for me. Thanks nice nugget of info.